EVE is not exactly a walk in the park. The guy with a big stick, a deep wallet, and loads of Skill Points is usually the victor in a brawl. Despite all this, the entrepreneurial spirit cannot be crushed, and many will try their hand at running their own corporation. I have come and gone from EVE about three times over the past four years, and what I’ve found is the same type of mix that you find in the real business world. You have the massive corporations, some of which are run well, while others sometimes seem to be held together by duct tape and pictures of cats. You have new ventures, starry eyed and positive about the future. You also have a sea of scams and traps to maneuver around and through just to stay alive as an organization. It’s a virtual world, but it’s about as effective a learning platform as there is for learning and educating others about the basics of key concepts and hard lessons that come in business. Personally, I had ascended to the position of Chief Financial Officer in a corporation called Frankenmouse Inc over the summer. It was an amazing opportunity. Not only did I get to interact with an executive team and make strategic decisions, but I was also able to lead groups of corporation members to operational success, both through in game activities and out of game voice meetings and market analysis. When I joined the group, things were progressing slowly, but all that was needed were a few motivated leaders to direct and delegate roles and responsibilities. Another executive member and I took it upon ourselves to lead fleets which resulted in exponential productivity for both us and our fleet members. From that leadership we were able to expose others to how organization in small groups makes things so much more profitable, and new leaders started to spring up from our example. The corporation currently owns a Player Owned Station (POS) from which they conduct industrial operations and are now generating a profit. Presently I have stepped down from that position to focus on my business school capstone activities and networking/blogging, but still function as a financial consultant and regular corporation member. Mission and Vision: I can’t overstate enough the importance of communicating a strong direction to your corporation members. In EVE, there are plenty of directions you can go, and without a clear direction, you’ll be chasing your digital tail forever. Pick a strategy, outline milestones, and adjust as necessary. An ounce of planning saves a metric ton of space ships from bursting into flames. Analyze and Measure: Progress is hard to see if you’re not doing some measurement. EVE’s system makes it difficult to account for corporation sales and purchases because there is no way to do them in the corporation’s name and corporation’s wallet. I used to regularly joke with the other executive members that we needed a Quicken account. Regardless of the shortcomings of the system, having a good handle on your numbers and understanding of the market will help you to become profitable much more quickly than stumbling around blindly. The system is actually excellent in allowing you to export information from the system to Excel, which allows linear regression analysis for the markets. When your organization grows and gets more complicated, I would advise using internal corporate Contracts to track your business transactions. Anything outside of that would be a logistical nightmare when it comes to trying to get people to report to an accounting journal. Patience and Flexibility: This concept does relate to real business directly, but in a non-traditional way. As an EVE corporation CEO, you’re not putting food on the table for your corporation members. People will come and go, your roster will change, but as long as you keep your mission and vision in the minds of your corporation members, you will continue to chug along. You can’t be afraid to take things slow at the beginning at the risk of losing some overzealous members. Building your team will always be the most important part, and allowing lone wolf players, as talented as they may be, part ways with you will turn out to be the best decision for both that individual and the organization. Just make sure not to burn a bridge and keep them in your network of contacts. A friend with lots of tenacity and experience putting it to use is always a good thing! Network: This is probably one of the most overlooked parts of EVE. In a 100% deregulated environment there are plenty of scammers, spies, and malcontents. Make sure to find people for your organization that specialize in the recruitment of new players and diplomacy between other groups. When dealing with potential allies, make sure that you can afford to lose whatever is being exchanged or available for new recruits. You are taking a huge risk whenever you partner with new players, be them recruits or other groups, and things can go bad in a hurry. Even long time relationships can go sour if there is a change in strategic direction or leadership. Never get too comfortable. 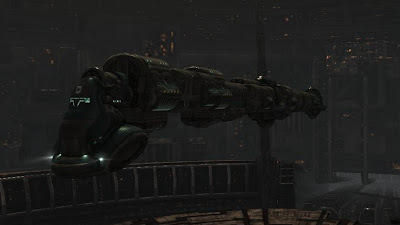 Internal and external security is key to any large scale operation in EVE, just like in real life. Follow these five steps and you’ll be well on your way to a successful corporation. Just remember that bad stuff always happens, but that those things will be stories you can tell as you roll through regions in your 256 man fleet, decimating anything in your path. EVE would be a pretty boring game if there wasn’t real loss, fierce rivalries, and anti-social psychopaths lurking in every system. A note to all those out there in the education world: Make EVE part of a 4 year college curriculum. The game incorporates everything from strategic planning, a living, player controlled economy, “industry” changes in the form of patches, statistics rebalancing, and new additions to the game, and ample opportunity for creating detailed financial reports and conducting market analysis, research, and marketing campaigns. A company with a good brand and social media presence will always outperform competitors with a weak one. Do you have any tips to add as a business leader, in EVE or in normal life? If so, share an engage! I look forward to the conversation.